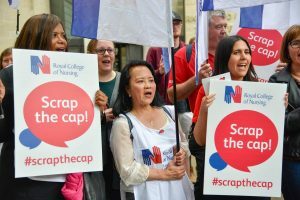 We’re hosting our biggest ever UK rally in Parliament Square, Central London, on Wednesday 6 September. Join us to show the UK Government it’s time to scrap the cap on nursing pay. Nursing staff, members of the public, friends and family are all welcome at this event. The North London Stop the War Coalition Team. For An Anti-War Government – No to Trump, For Peace & Justice in the Middle East! 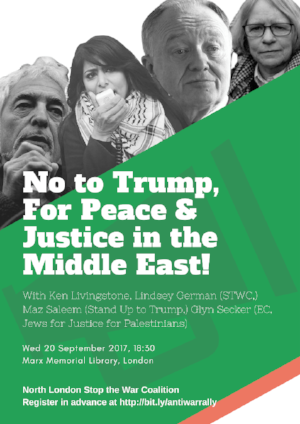 With Ken Livingstone, Lindsey German (STWC,) Maz Saleem (Stand Up to Trump,) Glyn Secker (EC, Jews for Justice for Palestinians). 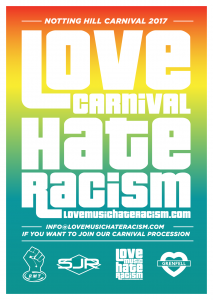 More special guests and details to be confirmed. Ware meeting at the North Finchley Greek Cypriot Brotherhood at usual 7pm on the 14th of September. 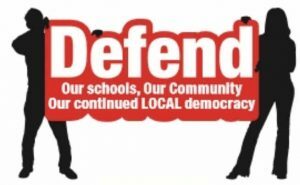 The meeting will be preveeded at 6.30pm by the Barnet Alliance for Public Services. 20:10:00 Lobby of local MPs regarding public sector pay cap? Exhibition: The Private Finance Initiative. How come we’re still paying for this? The exhibition illustrates the range of PFI deals across different sectors in the UK, including schools, health, roads, prisons, housing, and refuse into power schemes. It provides an overview of the extent to which PFI has swallowed up public funds and channelled money into corporate coffers. The exhibition is accompanied by a more detailed booklet. After a career in critical management research and teaching in the public and voluntary sectors, she is now using photography to raise and communicate critical concerns. These include the reconstitution of our public terrain as a marketplace, and how consent to this process has been managed, exemplified in the sell-off of the NHS. Join us online every Thursday in September at 2:30pm for a live webinar. Webinars are a great training tool for all union reps that you can access in the classroom, at home, on the go or in your workplace. Each week, a TUC expert will give a talk on their specialist subject and host a live Q&A session. Use this opportunity to join in the discussion, take part in our polls and live chat with other reps! All you need is a computer, tablet or smart phone, and internet connection. If you sign up today, we’ll send you an email reminder and notification before we go live. 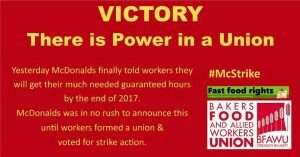 JOIN US SAT 2 SEP, 2PM, EAST FINCHLEY MCDONALD’S HQ: BFAWU Fast Food Rights and #McStrike workers NEED YOUR SOLIDARITY! 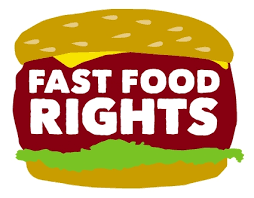 McDonald’s UK announced in a big fanfare in the press back in April that the y would offer every one of its UK workers a guaranteed hours contract. And yet it took 40 brave McDonald’s workers to vote for a strike before McDonald’s bothered to communicate anything to its workers about this promise. 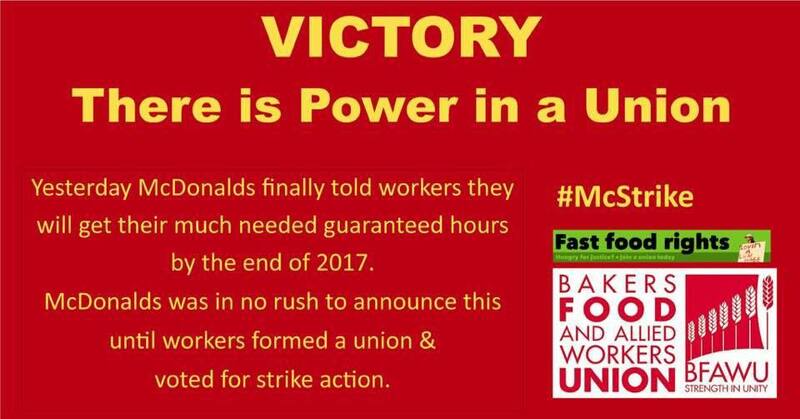 When the 95.7 percent YES vote to strike was announced, with the first ever UK McDonald’s strike now set to take place on Monday 4 September, suddenly McDonald’s UK stated they would deliver on their promise by the end of 2017. We say now sit down with our BFAWU bakers’ union president and m their living standards. BFAWU Fast Food Rights and our supporters will be outside McDonald’s HQ at East Finchley on Saturday 2 September – two days before the strike – with a table, chairs and a determination to get the promise in writing – we demand that McDonald’s meet us and guarantee that this time their promise is more than a publicity stunt. 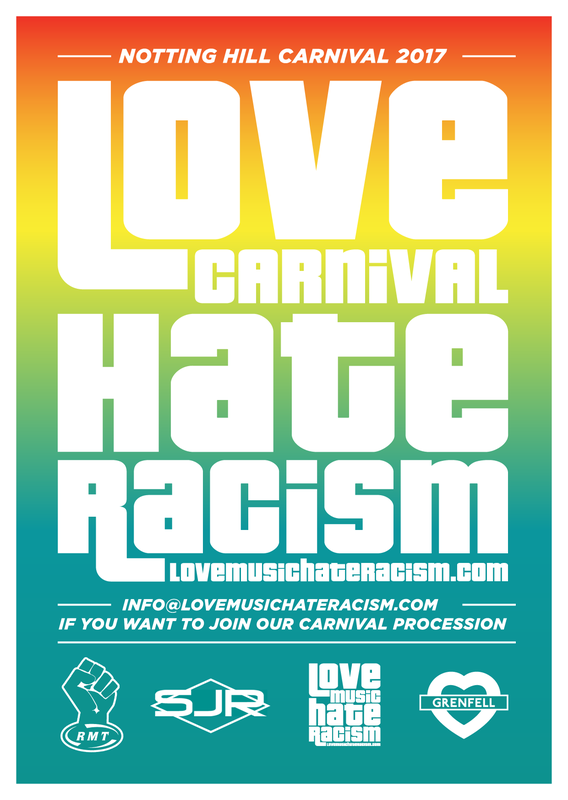 And we call on supporters from the wider trade union and social movement to join us there, with banners, with visible support for the workers taking this bold historic action in a display of solidarity before they walk out on Monday 4 September. ARK want the old Barnet football ground at Underhill, Barnet Lane. As Greenbelt, this cannot be developed, if spare school places exist. On Barnet Lane, is Totteridge Academy (TTA) with spare places. TTA has 29 acres of land if school places are needed in the future. Residents are seriously concerned about the narrow, bendy, country roads of Barnet Lane and Mays Lane which become congested as it is. Mays Lane supports a bus route. Two large secondary schools opposite each other is unwelcome. Why was our Greenbelt for Sale? Government Education Dept. bought it from Tony for £14.2 Million. 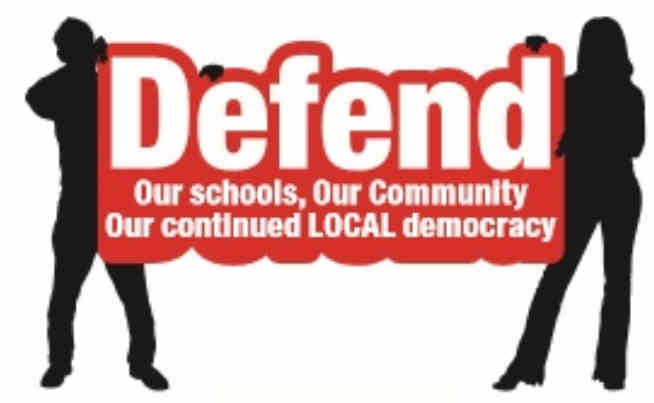 Why was public money spent before planning permission was granted and at a time when existing schools are suffering cuts and have had cuts year on year, to their education budgets? Ark Pioneer promotes “Blended Learning” from the USA which claims to cut costs with fewer teachers. Computer learning, currently augments education but what is proposed is experimental. It is ARK’s own curriculum and software with an increase in unqualified teachers. Google on Barnet.gov.uk, “Planning application: Underhill Stadium AND Hockey Club”. The reference Number is 17/4840/FUL. You can comment as a resident of this Borough or if you work here. email Conservative councillors/visit their advice drop in surgeries.